This is the page for reviews of books, videos, trips, etc connected with branch lines or railways in general. If you have a review to submit for this page, contact us here. Please note reviews of journeys along branch lines will be put on that branch line's page. This book looks at all the various electric units that could be found on the former Southern Region of British Railways in the first twenty years since privatisation. There are almost 200 previously unpublished colour photographs, many of which prick your memory of the various liveries that have been in existence with all the different Train Operating Companies. There is also a wide range of stations photographed though it would have been better if you could have been told where the location was at the beginning at the text, rather than having to hunt for it somewhere in the text. This book tells the story of Norman Hill who began working for British Railways in the 1950s as a clerical worker in the London Midland Division. After changing to the role of locomotive cleaner at Kings Cross station, he was eventually promoted to the post of second man. This involved accompanying the main driver as their locomotives transferred stock, mainly in the North London area and sometimes as far north as Peterborough. Each journey he made was meticulously recorded in great detail which forms the background to this book. This is quite a detailed book, which may put the average reader off, as a lot of it is detailed accounts of moving stock around. For me there was too much "railway speak" about what was going on, which made it difficult to understand the text. Also, more photos would have helped to break up the text more. It will appeal to those who work or worked on the railways, but maybe not to the casual railway enthusiast. This book looks at all the various preserved classes of locomotives, both diesel and electric, still working both passenger and freight trains on Britain's raliway lines in the 21st century. All the photos are in colour with suitable commentary accompanying each photograph. The scope and quality of each photograph is to be commended. There is such a wide range of locomotives in the book that it is impossible to mention them all. However highlights include Class 55, Deltic, 55022 Royal Scots Grey on a North Blyth to Lynemouth freight working; Class 52, D1015 Western Champion on an excursion on the North Wales mainline; Class 40, D345/40145 East Lancashire Railway on various tours; and Class 86 Electric loco 86259, les Ross on the West Coast mainline. A high quality book with high quality photographs. The years 1964 to 1997 saw many changes in Britain's railways, including the end of steam, the introduction of diesel and electric locomotives, changes in coaching stock and the corporate blue livery on many locomotives. This book chronicles all these changes and many more with a wide array of both black and white and colour photographs from the camera of Jim Blake. Whilst many of the photographs in the book are from the London area, the rest of the country is not forgotten with photographs of locomotives and trains at such places as Perth, Peterborough, Southampton, Rotherham, Glasgow and Manchester. Each entry has a detailed commentary explaining what is going on and just by looking at the photographs you will be taken back to a time when things were a little more simple and the railways were perhaps more interesting than they are today. 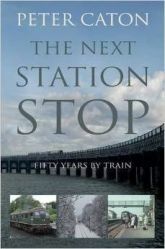 This latest book by Peter Caton, who wrote The Next Station Stop is another travelogue where he visits forty remote stations spread all over England, Wales and Scotland. He doesn't just go to stations on Britain's National Rail network though, but visits a few other "remote" stations. Some of these include stations on narrow gauge railways, such as Dduallt on the Festiniog Railway. Whilst some are on privately owned railways such as Ptarmigan Top Station on Cairngorm Mountain. Perhaps most unusual of all are the long gone remote stations like Riccarton Junction on the old Waverley Route and Tollesbury Pier on the closed Kelvedon and Tollesbury Light Railway in Essex. With this latter group, whilst no physical station still remains (in the main), he still visits the site of where the station was once situated. The interesting thing about the book is that for most of the time Peter is the sole passenger getting off at a remote station somewhere in the middle of nowhere. For instance at Shippea Hill in Cambridgeshire, after getting the only train of the day, he had to make an eight mile walk back to Ely to get a train back to London. Peter describes in detail what facilities each station has and what trains stop at these stations (if any). We are also given detailed histories of the station and the line it is on, which adds to the detail. Each station is illustrated with ‘now' and ‘then' photos which show you in some cases how busy these stations once were. The question begs, ‘Why are they still open?' The main reason is that it would cost too much to close them, and involve a lot of red tape. So although they may be in the "least used station" category, they still exist as stations where a train stops, even though there may not be a settlement of any size nearby. One remote station he did visit, Breich on the Shotts Line in Scotland was scheduled for closure, but thanks to his and other people's efforts the station was reprieved. It's a fascinating book, written in a style which makes you think you are actually there with him visiting these stations. So if you want to visit the stations at Corrour, Altnabreac, Berney Arms, Sugar Loaf et al, but can't afford the time or money to get there, then this book is for you. As someone who has travelled extensively on Britain's railway network for work and for pleasure, I found this book both interesting and enjoyable. The author, Peter Caton has walked a fine line between keeping the railway enthusiasts happy on one side, and the casual train traveller on the other. He seems to have achieved it with this book, managing to add the odd historical anecdote along the way. The main premise of the book is comparing train journeys he made as a child in the sixties and seventies, with those he makes with his work in more recent years. He is not afraid to put forward his views on such train related subjects as ever increasing train speeds, on board catering, train announcements and anti-social passengers. There are a few extra chapters at the end where he has ventured into Europe by train. These are also compared with Britain's present railways. All in all an intriguing read, with plenty to amuse, entertain and interest the reader; all written in a clear and concise style, Plus, there are several colour photos showing trains and stations from his younger days, which are compared with their modern equivalent. Paul Atterbury has produced the ultimate book on branch lines. Not only is the text informative and a delight to read, but also it is backed up by a wealth of excellent illustrations. The publishers have gone to town in providing many colour photos of branch line stations and traction from fifty and even sixty odd years ago. These are backed up with many original tickets, posters and postcards from a bygone era, all of which help to bring the text to life. This is billed as the "Final Printed Edition" ever, though already one or two other publishers are looking at the possibility of filling the future gap in the market that this will bring. For example, Middleton Press have brought out their UK Rail Guide which publishes the majority of timetables in the NRT. The main problem with a printed timetable for the whole of the network is the sheer number of pages involved, coupled with the cost of putting it together. Why at over 3,000 pages that's more than the Bible and Lord of the Rings put together! With sales falling from a 100,00 peak to a low of 20,000 it's easy to understand why this well be the last complete printed timetable. Plus with the Internet, you just look up your timetable in the click of a mouse. Personally I prefer a hands-on timetable which I can browse through at my leisure. It may become a bit dog-eared after a few months, but that's the joy of having an information book in your hands - you can move from one page to another to your heart's delight. Plus there's no pdf file to load up on your PC, which you then have to make bigger to actually read it.